Virtual Tours have been available for many years as the next step from 360° photography. Featuring immersive technology, the Virtual Tour is a simulation of a location, comprising a series of linked 360° images linked to allow a "walk through" experience. This page explores some simple options for Virtual Tours, using existing and emerging technology. The high resolution tours have been captured with a Digital SLR as a series of up to 300 linked and bracketed photographs. These are stitched together using specialist software and then further processed to incorporate them in a Virtual Tour. One of the earliest high resolution tours was originally photographed in 2009 as a spin off from a commission from the BBC to produce a series of mountain top panoramas. Some 10 years later, I have incorporated a number of my own Mountain top panoramas to provide a new Virtual tour. The panorama on the left shows the summit of A' Chailleach in the Fannich hills near Ullapool. 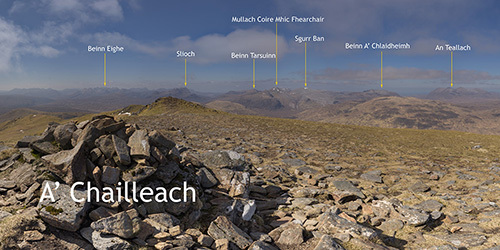 To aid understanding of context and scale of the views from mountain tops on a clear day, I have annotated many of the surrounding hills with their names. As the viewer pans around the image, the hill names are displayed. Look out for the icon at the base of some of the summit cairns which provides the option to view the hills with or without the names. With the advent of one shot 360° cameras with two wide angle, fisheye lenses set on opposite sides of the camera body, Virtual Tours have never been easier. I have tested some the latest cameras on the market and have compiled a few Virtual Tours to test their capabilities below. And, as cameras become more sophisticated, it's going to be interesting to see how the quality of Virtual Tours improves over time. Whilst some of the Virtual Tours on this page have been captured with the spherical 360° cameras, look out also for my tours featuring aerial photography, taken from the platform of an airborne drone. View the photographs on your PC, panning, zooming and scrolling with your mouse or alternatively, use your phone to look around you or to zoom in and out of the scene. Why not set the view to "VR" mode on your phone and use a Virtual Reality headset to view the scene as though you were there. Whichever means of viewer you use, enjoy the examples currently posted and look out for more examples coming soon. To find out more and to commission your own Virtual Tour, why not contact me using the details below? 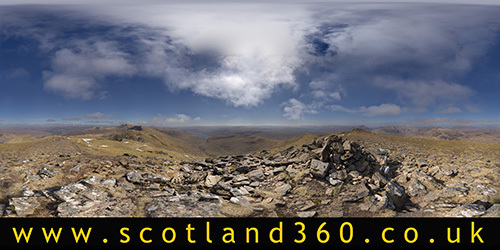 Click on the photograph of the view from the A' Chailleach summit to enter the Virtual Tour. Use the opening map to select any of the hills listed and enjoy touring the summits across the seasons! Pan and zoom around the 360° photographs, clicking on the interactive hotspots for photographs, web links and further information. Find the links to neighbouring hills and explore the view from nearby summits. Find the Brocken Spectre too...! And if you would like to see nearby summits named, then find and click on the links at the base of some of the cairns. The Fannich Mountains comprise some 16 Munros on either side of the A835 which runs from Dingwall to Ullapool. The hills are varied in character from the vast plateau of Ben Wyvis in the east to the crags of the Beinn Dearg Group in the west. With magnificent ridge walks and stunning views to the surrounding hills, the Fannichs can provide superb hill days out, all within easy reach of Inverness. Most of the photographs which comprise the Virtual Tour were captured as a series of bracketed exposures using a Canon EOS digital SLR. With the camera mounted on a panoramic head, the photographs were captured and then processed using panoramic software before being imported into the Virtual Tour. The Beinn Enaiglair panorama was shot using the Garmin VIRB360 camera to save time on an extremely cold winter mountain day. This Virtual Tour is a development from a photographic commission awarded to me by BBC Scotland in 2009. I had been commissioned to provide a series of interactive mountain panoramas. Whilst capturing the images for the BBC, I took the oportunity to capture my own photographs of the mountain summit views. 360° Panoramic photography has advanced considerably since 2009 and the BBC project was possibly ahead of its time. It did however allow for some invaluable developments for panoramic photography. 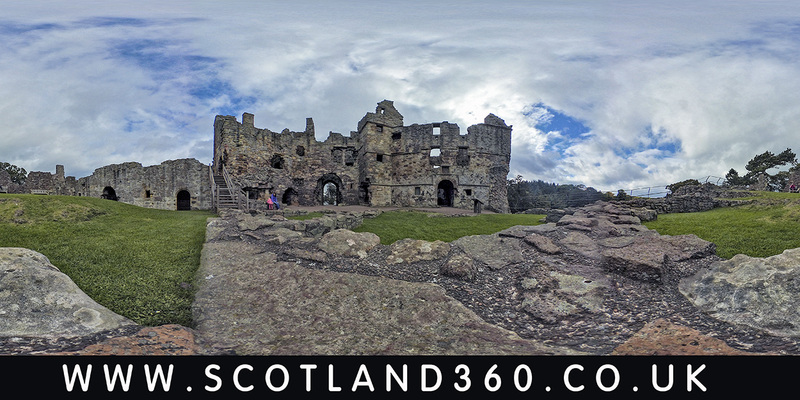 Click on the photograph of Dirleton Castle to enter the Virtual Tour. Dirleton Castle is a 13th Century medieval fortress in the village of Dirleton in East Lothian. Building of the castle began in 1240 and for many years, Dirleton Castle was an important stronghold, guarding the coastal approach to Edinburgh from England. The castle was heavily damaged during the Scottish Wars of Independence and, following several ownerships, was finally abandoned by the end of the 17th century. New on the market in July 2017, the Garmin Virb360 camera is an extremely capable 360° device. The images in this tour were captured as bracketed exposures, blended together in Adobe Lightroom and processed using the KRPano Virtual Tour software. All images were captured initially in jpg format but recent firmware upgrades to the camera now allow for capture of images in RAW format with a consequential improvement of both dynamic range and tonal quality. Urquhart Castle dates from the 13th Century and sits on the shores of Loch Ness in the Scottish Highlands. With a long history behind it, Urquhart Castle played a role in the Scottish Wars of Independence, was a royal castle and was partially destroyed in 1692 to prevent its use by the Jacobites. It was taken into stste care in the 20th century and is now one of the most visited castles in Scotland. 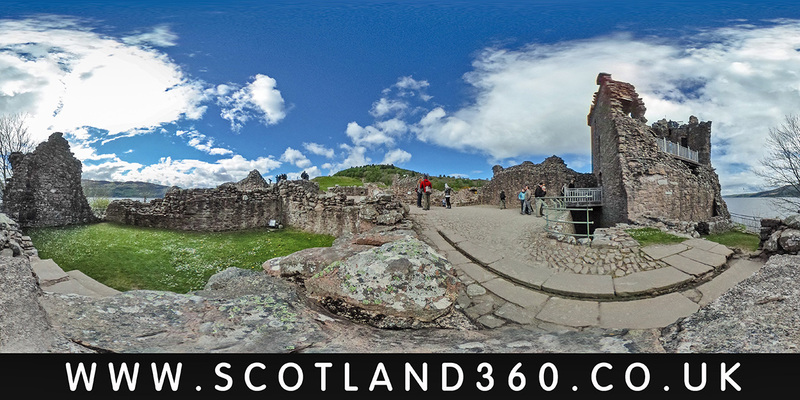 As part of a comtract with Highlands and Islands Enterprise in 2017 and 2018 to tutor the use of 360 photography, I used two 360° devices to capture this panoramic tour. The Ricoh Theta S and the Nikon KeyMission 360 were both used to capture the images in this tour. The images in this tour were captured, processed in Adobe Lightroom and processed using the KRPano Virtual Tour software.